Quetta has risen to 61 as two more injured succumbed to their injuries at a hospital, while over 160 police cadets and personnel of other law enforcement agencies were injured. 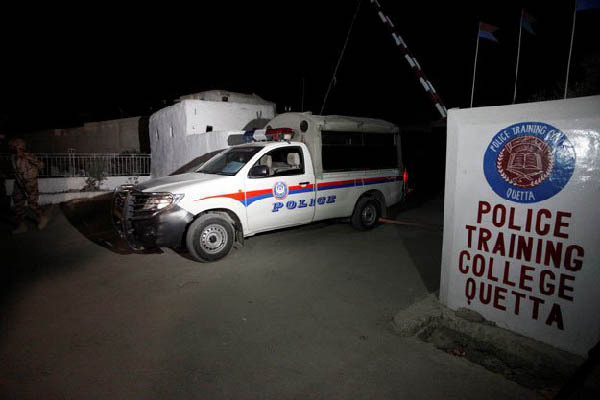 Banned militant organization, Lashkar e Jhangvi Al Aalmi attacked Police Training Center, some 13 kilometers off city last night, the Home Minister and IG FC confirmed. The doctors here at state run hospitals told APP that two more injured personnel of law enforcement agencies succumbed to their injuries and death toll had surged to 61. Medical Complex and Combined Military Hospital Quetta,” they said. “Bones of several cadets have been broken up as they received gunshots and splinters in carnage,” said, Prof Dr. Masood Qazi who is head of Orthopedic Ward at Sandeman Civil Hospital and BMC. that doctors carried out medical operations of several injured cadets. treatment to the injured,” he added. were brought to the hospitals and the management of Bolan Medical Complex Quetta said that three bodies were brought at the hospital. Medical Complex and remaining were admitted to CMH Quetta. General, Frontier Corps Balochistan, Maj Gen. Sher Afgun said that three suicide terrorists belonging to banned militant organization, Lashkar e Jhangvi Al Aalmi attacked Police Training Center, late Monday night, a compound spread over 12 acres of land and having training capacity for 700 to 800 recruits. tower of PTC and entered the center and main hostel where around 200 cadets were sleeping,” they said. Senior officials said that the Pak Army, Frontier Corps, Police and Balochistan Constabulary rushed to the scene and gun battle took place between the terrorists and the security forces which lasted for three hours. All three terrorists had worn suicide vests. Commander Southern Command, Lt Gen. Aamir Riaz, Home Minister, Mir Sarfaraz Bugti, IG FC, Maj Gen. Sher Afgun and IG Police Balochistan, Ahsan Mehboob who reached the scene, they themselves supervised the security operation against terrorists. which lasted for three hours,” a spokesman for FC told APP. Lashkar e Jhangvi Al Aalmi from Afghanistan,” he said. the area have been opened for traffic. Emergency was declared at all state run hospitals in Quetta. First, injured were brought to Civil Hospital Quetta and later, most of them were shifted to Combined Military Hospital. Chief Minister Balochistan, Nawab Sanaullah Khan Zehri who was also supervising the security operation, presided over a high level meeting which was attended by high ups from the government and law enforcement agencies. Governor Balochistan, Muhammad Khan Achakzai and Chief Minister, Nawab Sanaullah Khan Zehri strongly condemned act of terrorism at PTC. “We are in state of war on terror. Terrorists can not defeat us by carrying out act of terror,” the CM Balochistan said, adding that they would continue their war on terror until the end of last terrorists. The officials said that search operation had been launched in different localities of the provincial capital to trace out and arrest the suspects. Further probe was underway.